Homeschool Curriculum - So many choices are available to homeschoolers. And the number of choices seems to grow every year. While it can be a blessing to have so many choices available, it can also be a curse, in that it can sometimes be overwhelming to make final decisions. Which learning style fits my child? How much does this program cost? What grade level does this book teach at? What prerequisites are there to be able to understand this program? Which series allows for multi-age teaching? These questions and more go through our minds as we narrow down our choices for the new school year. If you read my post from Monday on Homeschool Methods, then you might remember that my teaching style has changed and progressed over the years. Going from the complete package deal to a pieced together "melting pot" of what works best for us. I will share some of the choices we have made for this year and little bit of why we made these choices. I am currently homeschooling a daughter for 8th grade and a daughter for 5th grade, and as you will notice, I don't always pick the same publisher for the same subject for both daughters. That is just one of the many beauties of homeschooling. I am free to pick and choose. I don't have to use the same publisher for all subjects for one daughter. And I don't have to use the same publisher for a subject with one daughter that I may use with the other daughter. Aleks.com (5th grade) - I am hooked on Aleks.com. We tried it a while back to review for the TOS Homeschool Crew and we have been using it ever since. I like that it assesses my daughter on a regular basis, re-evaluating where she is at. My daughter answers all questions online and Aleks checks them for me. Explanations and examples are readily available, right on the current webpage. Best part? My daughter can't progress until she truly gets it. With a regular textbook, it is easy to get ahead of yourself, to move on through a book without really getting a good grasp on the subject and topics. But with Aleks, it makes you consistently get the answers correct on any given topic, before allowing you to move on. It gives you the option of practicing the topic a few more times, even after you seem to have the hang of it. Here is my review for this program. Teaching Textbooks (8th grade) - This has been a good fit for my my daughter. It is a little like having a personal tutor. The instructor gives you a lesson on the CD-Rom. CD-Roms also include solutions to the problems, to help explain any issues you might have with a problem. Some of the Teaching Textbooks even allow your student to answer the problems on the computer, for automated grading. 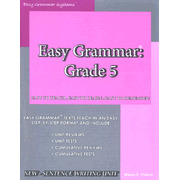 Easy Grammar (both daughters) - We have been using Easy Grammar for about 3 years now. It has worked great for both of my daughters. It is a Charlotte Mason style, with a little of a spiral style. It is just keeps building on learned skills, starting with the basis of the prepositional phrase. This series has broken grammar down into bite-size chunks, as my daughters are truly getting it. Beautiful Feet (both daughters) - Traditional textbooks for history have not been good fits for our family. They briefly touch on a subject and move on, without spending much time on any particular event or person. I discovered a few years back, living books work so much better for us. We pick a topic and dive in. We read books and magazine articles. We watch movies and documentaries. We visit museums. This is a new learning style for us, breaking away from the textbook. But I love it and it works. A friend recently recommended Beautiful Feet to us and after looking into it, I decided it could be a great asset to us, helping me pull all the resources together. I am excited to try it out. 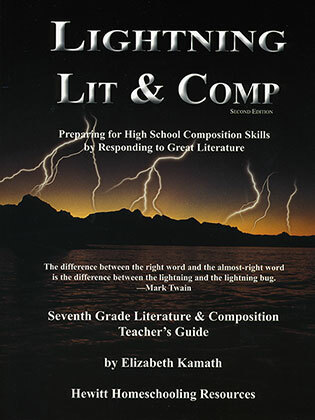 Lightning Literature (8th grade) - This is another item we recently reviewed for the TOS Homeschool Crew. Turns out a few of my friends have already been using it for years and really like it. We used it briefly for our review, and I was impressed with what I have seen so far. We plan to continue on with it in the next school year. I like the selection of reading, mixing it up with shorter and longer selections. The workbook contains a nice variety of worksheets. The writing assignments give choices, to help make it more interesting for the student. It is a Charlotte Mason style, which I am slowing working into. Here is my review for this book. Write Shop (5th grade) - Again this is a Crew item that I was impressed with. This curriculum is very hands on. Incorporating so many learning styles and so much creativity. It is a delight. I love the concept of the "sloppy copy". For the rough draft, you encourage your child to just right. Don't worry about mistakes; just right. It is your "sloppy copy". Then when you do the edits, you start by highlighting some of the things your child did right, before pointing out anything they need to correct. How cool is that? These are just some of the books we will be using this coming school year. Some, I have already been using and have been impressed with; others I have checked into and am very excited to try it. This coming year, like all the years before, will be an adventurel. We will gain knowledge from the curriculum; but, we will also gain wisdom and experience from our choices, which we can put to use next year when we begin planning again. It is a journey. Pricing ranges from FREE to a recurring GOLD membership of $17.99/month. You can also try the one-time $5 topic taster, to get an idea of whether or not this is a good fit for your family. You can learn more about your options here. Zane Education is offering a 35% discount on any annual Gold, Silver, or Bronze Membership subscription through the month of August 2012. Offering online educational video and online quizzes. Be sure to check out their very active FaceBook page. *Subjects include: Science & Biology, Social Studies (History & Geography), English (Literature & Writing), Math (free), Art, Music, Religious Studies, Health, Library Skills, Social Sciences. An Awesome Free Bonus, even with the FREE membership is the Christian Home Learning Guide. "Zane Education provides a Guide for Christian Homeschoolers demonstrating how to use the learning resources provided on this website to achieve the best educational outcome for the student. Zane also provides the Christian Home Learning Guide, a 420-page publication specially written for us by Marshall Foster and Ron Ball. 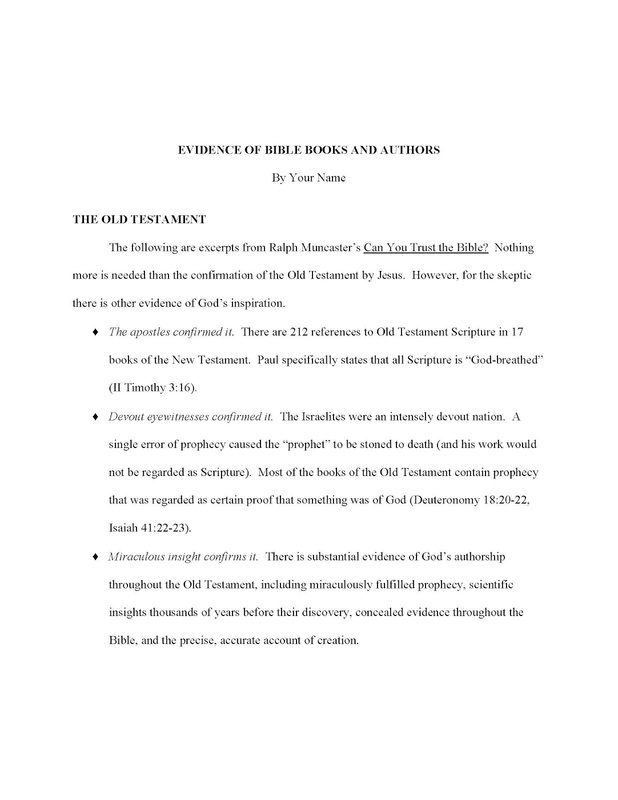 This book is a comprehensive publication that reviews all of the content and material introduced in our videos and demonstrates how it conforms to Biblical teachings and beliefs. 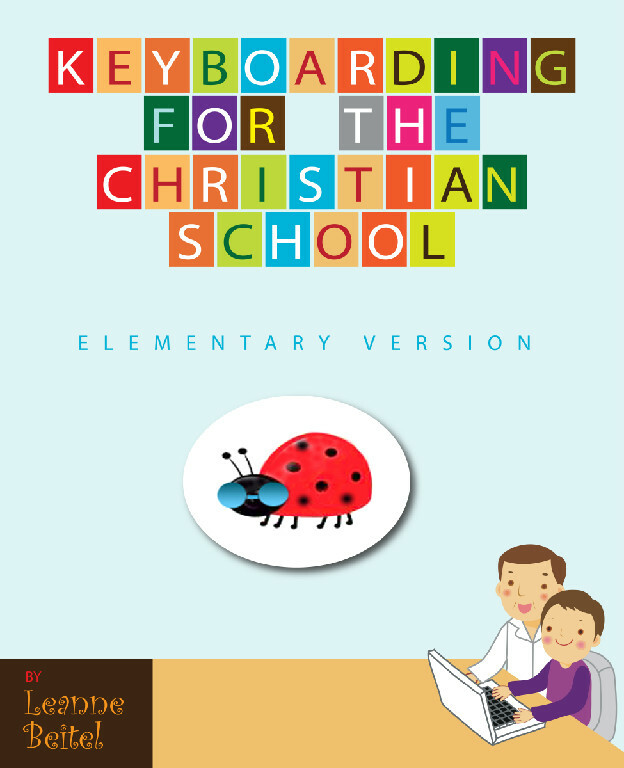 If you are a Christian Homeschool family then this book will provide you with the confirmation you need to know that your child will not be receiving any information that does not conform to Christian teachings and beliefs. This Guide can be downloaded free of cost on our Downloads page by those people that have completed a free Registration for a free Basic Membership." A really neat and unique feature of Zane Education is something that they call THE MISSING LINK. This means using subtitles and closed captioning on their videos, except the math videos which come from a different company. Using subtitles helps with a variety of learning styles. Your child can watch the video, listen to the video, and if they choose...read along with the video. It is helpful for not only basic learning, but also for ESL and special-needs students. I, personally, enjoy reading along. It helps me process the information better. Includes the following subjects: Art, Biology, Geography, Health, History, Library Skills, Literature, Math, Music, Religious Studies, Science, and Social Science. Skill levels range from Elementary Grades up through Adult. First I recommend that you start with the "Getting Started Guide" and the "User Guide". Second, I recommend that you read the Christian Home Learning Guide. It is FREE with membership and a whopping 424 pages. It is a wealth of information, a unit study lover's dream. 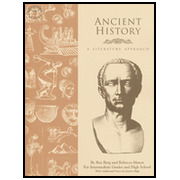 The guide covers a timeline of history from a Christian perspective, including review questions, related scriptures, suggested readings, and a glossary. The guide lists the relevant videos to correlate with the topics. "At times, you will encounter secular interpretations of events in the Learning Videos. There is, for example, a clear, evolutionary bias in the material in the Biological Sciences series. Do not be alarmed! It is our conviction that students should know and understand positions outside of evangelical Christianity. We are confident that their faith will be stronger when they know both sides and understand why we believe the biblical view of the world is correct both intellectually and spiritually." You will have to decide for your family how to handle videos such as these. You may choose to avoid these videos or you may choose to watch them, while discussing why you agree or disagree with certain statements. I chose to view them and discuss them, explaining to my daughters that they can expect to meet and interact with many people who share these beliefs; but also explaining what we believe and why. That way when they are exposed to these sort of conversations in the future, it won't come as a total shock and they will be more prepared with an answer as to why they believe what they believe. In addition to this guide, the website is also a wealth of information. This site covers so many topics. Without the guide, your hardest job might be deciding just where to start. The videos are arranged by topic and by age level. The videos are accompanied by online quizzes, with automated grading. In addition to the videos and quizzes, Zane Education is jam-packed full of resources...for homeschool, for Christian education, for special needs, for ESL, and more and more. I am impressed with this site with its videos and quizzes, with its guides and resources. Homeschool Methods - Each homeschool is unique in its own way. Different styles, methods, curricula, schedules. 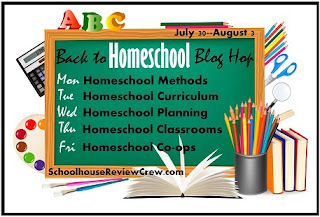 Today's blog hop is about the variety of methods homeschoolers use. Complete packages deals, Traditional Textbooks, Classical, Unit Studies, Unschooling, Charlotte Mason. When I first began homeschooling, I bought the whole package deal. Complete sets from online sites for the first two years. I was knew to homeschooling and didn't feel very confident. So I wanted a curriculum that would help me to "get it right." This approach was best for me as a beginner. It helped me to gain self-confidence. With a few years of experience, I began to piece together curricula from various publishers. Finding what I could used and then ordering the rest that I needed new. This worked better for us. It saved a ton of money buying used at homeschool book sales, yard sales, and online auctions. It also helped to find books and programs that were a better fit for my children. Company A's math book might work great for my daughter; but Company B's grammar book might be a better fit for her. I like mixing and matching to get what really fits for my daughters. Then we came across other alternatives besides using the traditional math textbooks. 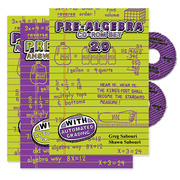 I'm loving the new options available for teaching math, especially the higher grade levels. Lectures and tutorials are available on CD-Roms, DVDs, and online websites. CD-Roms and Websites often even do the grading for you! Next we were introduced to Charlotte Mason style grammar and literature programs. No more stuffy workbooks and textbooks. These CM style books teach in a whole new way, different from what we have been used to, but different in a great way. So our homeschool adventure has been a journey. Starting with the box packages, moving into an eclectic mixture of this and that, and now gradually making our way into a more Charlotte Mason/Living Books method. I am intrigued by the Charlotte Mason Method, but I still have a lot to learn and a long way to go before I will truly grasp the whole concept. Until then, we are enjoying the journey. For a much better deal, use Coupon Code: BLGAM30, for 30% savings. Expires 8/31/12. 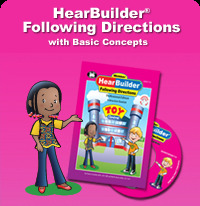 So just what is the HearBuilders Series? 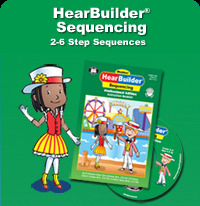 Well, Super Duper Publications has included samples of 6 activities on their website. Go check them out. They also have included a 10 page document giving detailed information on the "Theory-based, systematic approach". 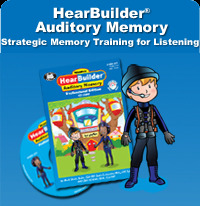 Webber® HearBuilder® Auditory Memory includes five activities to help students practice important auditory memory, closure, and comprehension skills. Students become Recall Agents and help save MemoryTown from Dr. Forgetsit while learning key strategies for remembering numbers, words, sentences, and stories. Learn more about the great minds behind this software by reading some of their biographies. This software program is designed to help your children listen carefully and retain the information for an extended period of time, to be able to recall the details at a later time. The parent can set up each individual student, up to 4. You can pick if your child will stay on a certain level, or gradually increase difficulty, or play with background noise to increase the difficulty even more. Your child can pick from different categories. Details - Click on the agent described such as "blue pants, no backpack"
Auditory Closure - Complete phrases, such as "peanut butter and..."
If your child gets six correct answers in a row, he earns a break called "Super Six". This will earn him a quick little game to break up the intensity of the listening. If your child gets several wrong in a row, the program will offer helpful hints for remembering information for an extended period of time. The skills get increasingly more difficult as your child progresses through the rounds. A progress chart helps you to see how your child is progressing in the levels. I used this with all 3 of my daughters (3, 10, and 13 years old). I set my 3 year old to stay on the beginning level. I set my 10 year old to stay on a medium level. Then I set my 13 year old to increase to the highest level. It is nice that the software gives you this flexibility. Otherwise, it could quickly become too difficult and frustrating for your child. My 3 year old thought the game was a lot of fun. She has asked to play it many times. Her favorite categories are Details and Planning. With Details, the announcer might say "Click on the boy wearing shorts with no backpack". She then has to remember that description long enough to click on the correct person. With Planning, she listens to two spies tell about their secret plan. Then she answers a random question like, "What was the name of the store where they were meeting." She was able to answer most categories on her own. She did need help remembering number sequences for breaking the lock. My 10 year old didn't ask to play, but did seem to enjoy it while playing. Her 3yo sister would usually come over and join her to help play. She did well in all categories. But occasionally she would get enough wrong that the program would offer her some helpful hints for remembering. I think playing this game will be helpful for her. She sometimes struggles with processing what she hears in order to recall it later. My 13 year old only played it a few times. She felt it was too repetitive. She does have a point. My 3yo didn't seem to tire of it. And my 10yo could easily switch back and forth between different categories to help keep it more interesting. But each category is basically the same thing over and over. For example the Details category. You might look for "the girl with a backpack wearing blue pants", then next time for "the boy wearing glasses and a blue shirt", etc. So you are finding a new person each time, but you are still selecting the correct person over and over. So do I think it is helpful? Yes. 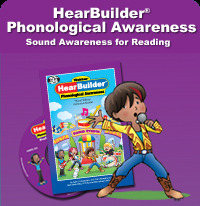 I think this program would, over time, help a child learn to really focus on what she is hearing and process and retain it, to use the information at a later time. Do I think it is fun? It depends on the child. My 3yo hasn't tired of it. My 10yo will play it for about 15 minutes at a time without complaint. But my 13yo finds it repetitive. My favorite is the Details category, while I quickly tired of the Numbers category, entering the combo numbers over and over. So maybe the younger your child is, the more likely they will enjoy the game. And of course, the more they play it, the more difference it is going to make. 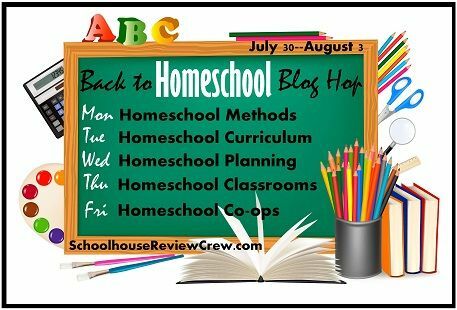 Come join us from July 30 - August 3 for 5 days of Blog Hopping with our Back to Homeschool Blog Hop. More than 70 members of the Schoolhouse Review Crew will be participating. Be on the lookout. Some members will be offering giveaways. Homeschool Methods Unit Studies, Charlotte Mason, Unschooling, Classical? Which homeschool method is right for your homeschool? On Monday, the Crew tackles this topic, bringing you their experiences, tips, and recommendations! 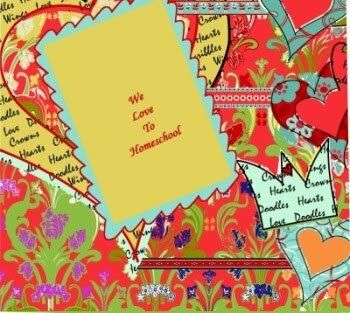 Homeschool Curriculum The most popular question among homeschool momma’s has to be, “What curriculum do you use?” If there’s anything these bloggers understand, it’s curriculum! On Tuesday, the Crew shares their favorite choices with you! Homeschool Planning I suppose the 2nd most popular question among homeschool mommas might be, “How do you plan your homeschool day . . . week. . . year?” From year around schoolers, to traditional “public” school schedules. From days planned out practically minute by minute to those who “wing it,” the Crew will share their planning tips with you on Wednesday! Homeschool Classrooms I just love catching a glimpse of homeschool rooms. Some folks have classrooms decked out with teacher and student desks, chalkboards, and walls covered with charts and maps. Others spend more time on the couch or kitchen table. Come take a peek at the Crew’s homeschool classrooms and other spaces on Thursday. Homeschool Co-ops To co-op or not to co-op, that is the question. On Friday, the Crew will share their experiences, both positive and negative, with this form of homeschool enrichment. More than 70 members of the TOS Crew will be submitting blog posts. Maybe you will see an old friend; hopefully, you will make a few new ones. Here is the blog roll call. Sarah D. @ Ahoy Maties!! Special thanks to Marcy for pulling this together, for the great descriptions of each day's agenda, and for the blog roll. Thanks, Marcy! 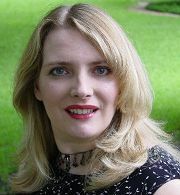 Check out her great blog at Ben and Me. 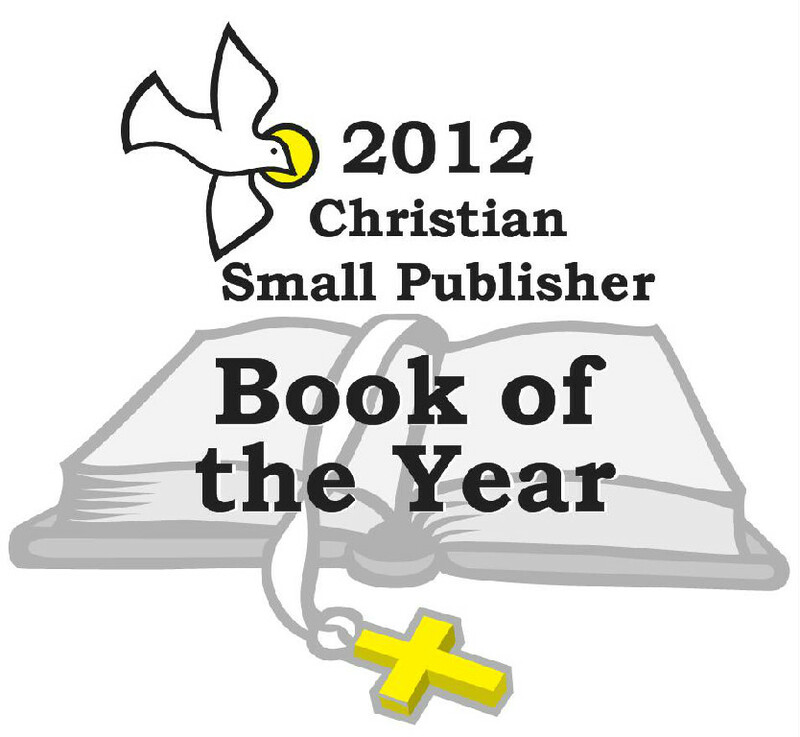 Christian Keyboarding is offering a 20% discount for my readers through August 29, 2012 with the code of SUMMER2012! 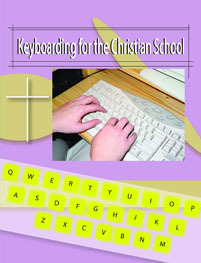 Leanne Beitel designed this program after searching for Christian Keyboarding material and not finding any. 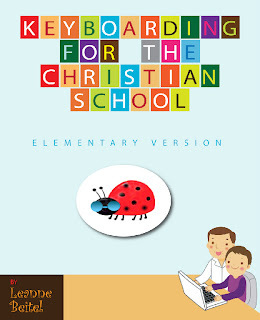 If your child is going to type something while practicing their keyboarding skills, why not let it be Scripture? Leanne offers some other materials on her website also, including an Elementary Level Keyboarding eBook. While you are there, check out some freebies and samples on the website. In 2010, I reviewed the Elementary Version. This program is an instant download that teaches typing skills using Biblical-based references for copywork. It includes not only basic keyboarding skills, but also more in-depth skills that will be helpful when writing school/work papers. The material covers things such as APA and MLA reports, letters, and tables. If you prefer a glue-bond textbook, you may contact Leanne for special pricing. Here is a sample lesson. Again, if your child is going to spend time transferring lessons from paper to the computer, why not let it be "whatsoever things are pure"? The lessons are short and manageable. You should be able to fit in several lessons a week. It goes in a gradual succession, starting at basic posture and finger placement, then onto key placement (including numbers and symbols). 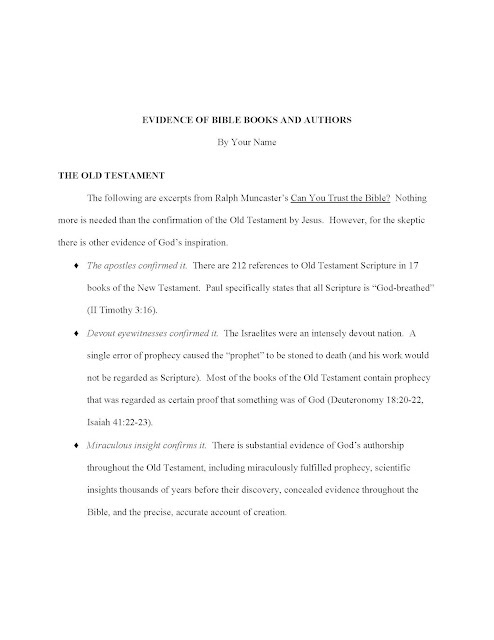 It gradually works up to copywork of Bible verses, formatting such as centering and tables, and also report formatting. It is designed in a way that a high school student can work through the program independently. 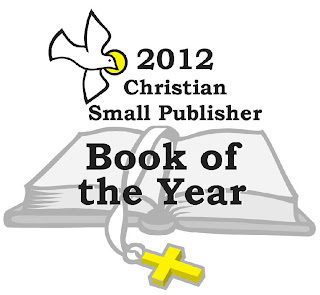 It is a solid, thorough program at a reasonable price, with Christian copywork spread throughout. So the question is...did my 7th grade daughter enjoy using the program? Honestly, no. And if you look back at my review from 2010, you will see that she didn't enjoy the Elementary Level that time either. But...I don't think she would have enjoyed any keyboarding material. She didn't have the desire to learn it, didn't see the use in learning it, and therefore considered it a waste of her time. She is perfectly happy "hen-pecking" on the keys and pointing out that she can "hen-peck" quicker than she can type the "correct" way. 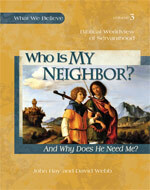 Apologia offers four books in its Worldview Series, "What We Believe". 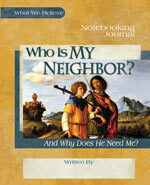 My review is for the third book in the series, "Who is My Neighbor". Last year, I also reviewed the first book, "Who is God". You can read my review here. There are three components to this set: the textbook, the journal, and the coloring book. I reviewed the first in the series, Who is God, last year and was impressed with the book. At that time, I only received the text book. But even with just the textbook, I was very impressed with the study. It was in-depth and thought-provoking and an on-going story was included in each chapter. So I was happy to be chosen for this review of Who is my Neighbor. And to my surprise, this set now comes with not only the study guide, but also a journal and a coloring book. 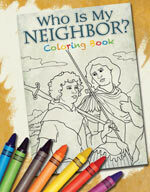 The coloring book is great for the younger set and for those who like to keep their hands busy while listening. The pictures are nice and coordinate with the study guide. The journal is a great asset to the study. 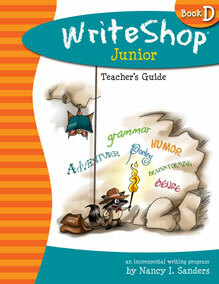 It has some comprehension questions, some get-you-thinking questions, word puzzles, blank journal pages, and more. It helps add a lot of meat and variety to the study. And when it is complete, it will make a great keepsake. A schedule is included, which is helpful with planning. Sometimes it is hard to find a good stopping point with some studies. So the schedule is a welcomed addition. The study guide itself has not disappointed. I am impressed with this series. It is very in-depth, thought-provoking, and appeals to a very wide age-range. The guide gives reasons why God expects us to love and to help others. It talks about just who is our neighbor and what sort of things we can do to show true charity. The guide includes scriptures to reinforce the lessons. It also weaves an ongoing story through the book. A family escapes from China during a dangerous time, to begin a new life in San Francisco. They are amazed at how many strangers show them kindness and charity along their journey, and struggle to understand why they would do so. Sometimes we learn best through stories. Just think of Jesus and His parables. I am happy with this study, am thankful to have received it, and plan to continue using it through the summer in our Bible Study. During the summer months, we usually participate in some of the local summer reading rewards programs. We fill out the form to receive a free book at Barnes and Noble. We used to do the same at Borders, until it closed. And we always join the library program. But this year, I would like to do something more than just earning a free book. Something to get them really motivated to read for pleasure, instead of required reading for school lessons. Now don't get me wrong. Both of my daughters, of reading age, enjoy reading. And they do read on their own, without prompting, just because they want to. But I would love for them to read even more. To pick a book over a TV show. To pick a book over a Computer Game. And I'm thinking that a Family Summer Reading Rewards program might just be the ticket. But where to start, that is the question. I'm hoping some of my readers have some suggestions for me. Have any of you ever done this? I have to decide if they pick any book of their choosing...or if I should make a list of some great choices, and then let them pick from there. I mean is it strictly for enjoyment? Or should I try to get some side benefits out of it, like focusing on books about certain time periods, events, famous people, etc? Or maybe a mixture of both options? I need to decide how to judge progress. Should prizes be based on number of books read, or number of pages read, or how much time spent reading? And how do I keep it fair with a 3 year age gap between the two daughters? Meaning that one can probably out-read the other one. Also what kind of rewards should I offer? Family time, gift cards, privileges, money? I would love to hear your thoughts about what has and hasn't worked for your families. 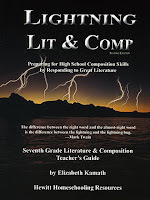 8th grade Lightning Lit is also available. The grade 7 and 8 guides are year-long courses consisting of a student guide, a student workbook, and a teacher guide. The Student Guide includes biographies of the authors, vocabulary, comprehension questions, lessons on the readings, additional lessons on composition, and writing exercises. The Student Workbook is consumable. The Teacher Guide includes a teaching schedule, answers to comprehension questions, answers to the workbook pages, extra teaching help for the lessons, help in choosing appropriate writing exercises, and discussion questions. We have tried a few different writing programs. Some we have liked more than others. Still, I was curious to try this approach, in which reading classic literature is used to teach great writing. My daughter didn't particularly like having to read pre-selected books. She would rather pick her own choices. But I have read several times recently, that a great way to learn to be a good writer is to read good writing. So, I appreciate the concept behind this curriculum. The program comes with a teacher's guide, a student textbook, and a student workbook. You can either buy the selected readings from Hewitt in the kit, or you can purchase/borrow them on your own. The concept is simple. Read good literature, study it and learn from it, and then write your own. The Teacher's Guide includes an answer key and a suggested schedule, which I appreciate. It also provides teaching tips that help me to help my daughter. For each lesson, your child will read an introduction of sorts to selected story. Then, he will have a scheduled time to read the selection. The amount of days given varies, of course, depending on the length of the book. A vocabulary list is provided to help with familiarizing your student with some of the more difficult words in the stories. When my daughter read "The Bride Comes to Yellow Sky", there was a chunk of words on the list that I didn't even know. So when reading books from 100 years ago, the word list comes in handy. After reading the selection, your child will go through some comprehension questions. Some are straight-forward questions, such as where was the main character going...the type of questions that have definite right answers. Some questions are more open to interpretation, such as how do you think someone felt. The teacher's guide has answers to the comprehension questions. So you will have a good feel for whether or not your child read/understood the story, even if you haven't read it. Several worksheets are provided to go along with each selection. Some are crucial to the program, such as studying the structure of a story. Others are optional, like the word puzzles. When it comes time for your student to do her own writing, they will be given a few choices. Your child can pick and choose, making sure to do at least one writing per chapter. But they can do as many as they like, as time permits. I appreciate that the student is given some freedom of choice. 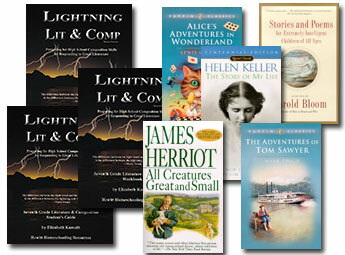 The curriculum picks from a wide-range of stories. Some short; some long. Some fictional; some non-fictional. Of course, there will be some stories a child will like better than others. There may even be a story that he doesn't like at all. Such is life. But most students should enjoy at least most of the stories and they can learn from all of the stories. Like I mentioned before, my daughter wasn't thrilled that the stories were already selected for her. But let me tell you, we now have a new fan of "Riki-Tiki-Tavi" in our home. And she would have never even heard of this story, let alone ever read it. So it has opened up new doors to literature for her. I am THRILLED this curriculum came our way. The concept is ideal. If you want to be a great writer, read the works of great writers. My daughter doesn't mind using it, which is a HUGE plus. The schedule helps keep me on track and gives my daughter a schedule for how quickly she should read the stories. The program has lots of different aspects to it, to help keep it interesting and to give breaks between the writings, such as the included word puzzles. It also not only assigns the writing, but it gets into the fundamentals of what really makes a good writing...things like foreshadowing, introductions, dialogue, etc. This book is a keeper and will definitely be part of our curriculum for the upcoming year.